This story from St. Louis, which my Cato colleague Walter Olson cites in a post about OSHA, is a typical example of bureaucratic stupidity and absurd “safety” laws. My favorite part is that the bureaucrat actually thought it would be reasonable to rent a lift for $750 per day just to attach a harness for somebody working only 11 feet off the ground. I’m sure the consumer would have been happy to swallow that additional cost. Reminds me of the classic Dave Barry column I cited in this post. Good to see that the Occupational Safety and Health Administration is just as incompetent today as it was decades ago. In April, Heffernan and his nephew were working on a house in the 6400 block of January Avenue. Heffernan had finished rebuilding the chimney and his nephew was finishing up the job when Heffernan left to bid a job in West County. While he was looking at the prospective new job, he got a call from his nephew. There was some kind of a problem with an inspector. Heffernan returned to the site on January Avenue and found that an inspector for the Occupational Safety and Health Administration had shut down the site. In other words, she had told Heffernan’s nephew to stop working. Heffernan was taken back. …He said the inspector had written several citations. The first thing she told him was his scaffold wasn’t level. He said he pulled out his level and put it on the scaffold to show that the scaffold was level. He said the inspector then wrote down the brand name of the level, as if there might be something wrong with his equipment. …He said he offered to let the inspector walk on the scaffold, but she declined and said she was afraid of heights. The inspector told him his nephew needed a helmet and a safety harness. “We have safety harnesses. If the job requires it, we wear them,” Heffernan said. “But my nephew was only about 11 feet off the ground. I told the inspector I didn’t know what I was supposed to attach the harness to. She told me I could rent a lift and run the main pole above the chimney and have the safety line from that hooked to my nephew. A lift costs about $750 a day. It made no sense.” …Heffernan received notice in the mail that he had been cited for three violations. …Heff’s Tuckpointing is a successful operation, but it cannot afford $3,600 in fines. …So Heffernan requested a meeting to contest the violations. He said he spoke with an OSHA compliance officer who offered to drop the first violation and reduce the fines of the other two by 40 percent. Heffernan refused the offer. He has now requested a formal hearing. According to news coverage, United Kingdom Prime Minister Cameron is imposing deep and savage budget cuts. I was interviewed by the BBC recently, for instance, and asked whether 25 percent spending reductions were too harsh. And here’s an excerpt from a New York Times story that is very representative of the news coverage. Like a shipwrecked sailor on a starvation diet, the new British coalition government is preparing to shrink down to its bare bones as it cuts expenditures by $130 billion over the next five years and drastically scales back its responsibilities. The result, said the Institute for Fiscal Studies, a research group, will be “the longest, deepest sustained period of cuts to public services spending” since World War II. …Public-sector unions are planning a series of strikes. Charities — which Mr. Cameron has said should take over some of the responsibilities now held by the state — say that they are at risk of collapse because they are so dependent on government money. And the chief executive of the Supreme Court, the country’s highest, said she did not know whether the court would be able to function at all if its budget were cut by 40 percent. To be blunt, this type of analysis is completely false. 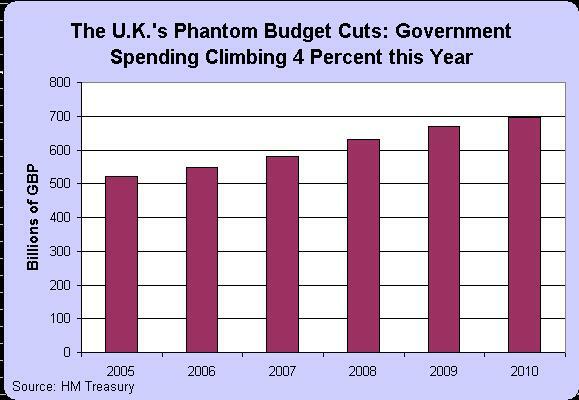 There are no budget cuts in the United Kingdom, at least in terms of total government spending. Instead, the politicians are measuring cuts against some imaginary baseline, which is the same scam that happens in Washington. So if spending increases by 4 percent instead of 7 percent, that is characterized as a 3 percent budget reduction. The chart shows what is happening with overall government spending in the United Kingdom. Notwithstanding phony stories about budget cuts, spending in Prime Minister Cameron’s first year is climbing by more than 4 percent – twice as fast as needed to keep pace with inflation. This doesn’t mean that Cameron isn’t doing anything right. There is a two-year pay freeze for bureaucrats, for instance, which is at least a small step in the right direction. But the Tory-Liberal Democrat coalition is not a good role model for those who want limited government and fiscal responsibility. There are promises of spending restraint in future years, but those belong in the I’ll-believe-it-when-I-see-it category. Spending is supposed to increase by less than 1 percent in next year’s budget, for instance, but politicians are very good with tough talk of fiscal discipline in future years. But if we judge them by what they’re doing today rather than what they’re claiming will happen in the future, Cameron’s policies leave much to be desired. The tax side of the fiscal equation is even more depressing. There is small reduction in the corporate tax rate, but otherwise there is considerable bad news. The new government is leaving in place the new 50 percent top tax rate imposed by Gordon Brown as an election-year class-warfare gimmick. It is boosting the capital gains tax rate from 18 percent to 28 percent. And it increased the VAT rate from 17.5 percent to 20 percent. Should the FDA Get More Power after Salmonella Egg Scare? Steve Chapman of the Chicago Tribune makes several excellent points in his column on the recent salmonella scare, commenting on the absurd tendency to reward government bureaucracies that screw up. But more important, he explains that there are very strong incentives for safety in an unfettered marketplace. The fundamental issue, though, is that there is no way of completely eliminating risk in society, so the responsible approach is finding the best ways to minimize risk without imposing excessive costs. Relying on free markets is surely the best answer, though the government does have a role. As Chapman notes, a well-functioning tort system ensures that companies can be punished by people who suffer damages. Command-and-control regulation, by contrast, is a very expensive and inflexible approach. In the private sector, entities that fall short of doing their jobs find themselves forced to shrink. In the public sector, the opposite is typically true. Failure is an option, and often a beneficial one. The Federal Reserve Board and Treasury facilitated the 2008 financial crisis? Then obviously we have no choice but to give them even more responsibility. The Securities and Exchange Commission let Bernie Madoff rob investors? A bigger SEC will be a smarter SEC. Just once, I’d like to see a government official say, “We blew it, and you know what? If you give us another chance, we’ll probably blow it again.” But so far, my hope has not availed. It’s true that the FDA is charged with assuring food safety. But really, the government can’t do that. The task is too big and too complex. Fortunately, it doesn’t have to do it, because the pressures of competition force producers to make sure their goods are clean and wholesome. What goes curiously unnoticed is that egg suppliers and grocery stores have nothing to gain from sickening their customers — and a lot to lose. It doesn’t take many obvious hygiene lapses for a company to get a bad reputation, and a bad reputation can be catastrophic. In 1971, a New York man died of botulism after eating a can of Bon Vivant soup. If you’ve never heard of Bon Vivant soup, there’s a simple explanation: In no time at all, the company was bankrupt and the brand was as defunct as William McKinley. The farms implicated in this episode are likely to find themselves oddly short of buyers in the coming months, if not years — unless they can prove they have taken drastic steps to clean up their act. But the burden of proof will be on them. They can also expect to be sued for huge sums of money. Meanwhile, there are plenty of other companies that didn’t screw up, whose wares will be more attractive going forward.